No. 7, Jalan TS 6/10, Taman Industri Subang, 47510 Subang Jaya, Selangor, Malaysia. Instant Scaffolds & Machinery Sdn Bhd (ISM) is the distributor in Malaysia for aluminium scaffolds manufactured by Instant Upright Inc, Ireland. Since year 1991, we have been providing one of the safest and quickest access solution for maintenance, cleaning, renovation, repair, etc. utilizing high quality products from Instant Upright. 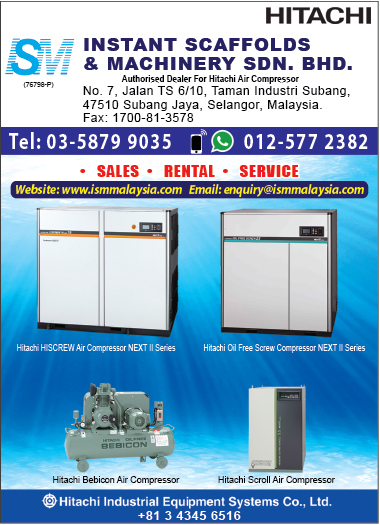 In year 2010, under the excellent leadership of our Managing Director, Mr. Loh Foo, being one of the pioneers in the compressed air industry who has more than 30 years of experience in marketing of Hitachi Industrial Equipment in Malaysia, ISM is also committed in the sales and services of compressed air equipment in Malaysia. "To meet & exceed our client's expectation with our unparalleled dedication & commitment" is the motto of ISM.